Popular Technology.net: Rebuttal to "Crock of the Week - Flogging the Scientists"
Peter Sinclair AKA "Greenman" a cartoonist and Al Gore disciple has been hard at work creating YouTube videos that smear skeptics and their arguments. The following is a complete rebuttal to his "Crock of the Week - Flogging the Scientists" video. 2. Sinclair then uses a strawman argument by comparing peer-reviewed journals to the conspiracy website InfoWars, the conservative news site WorldNetDaily and the UK's conservative newspaper the Daily Mail. 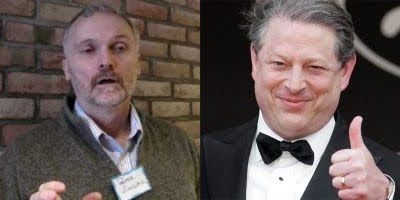 Despite these site's excellent coverage of Climategate (even conspiracy sites get some things right) they are never confused by prominent skeptics with peer-reviewed journals. This appears to be a failed attempt by Sinclair to pretend a conservative source agrees with his position. BBC: Do you agree that from 1995 to the present there has been no statistically-significant global warming? This question originated with Dr. Richard Lindzen, Ph.D. Professor of Atmospheric Science at MIT who has been trying to make a point about the ridiculously small fractions of a degree in temperature change that are being debated. 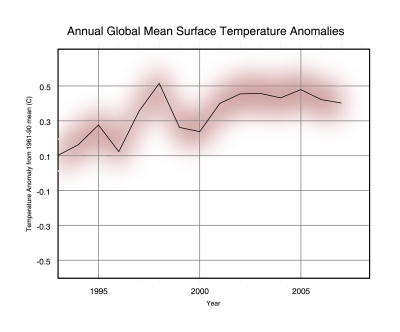 When standard error bars are applied to these, you are left with no statistically significant warming in 15 years. Without statistical significance you cannot rule out that any recent positive warming trend did not occur by chance or in this case, measurement error. "We revisit the application of the statistical methods used and show that estimation of the regression coefficient is not robust." "Although we agree that there is considerable uncertainty in the prediction of future sea-level rise, this approach does not meaningfully contribute to quantifying that uncertainty." "This issue was highlighted by the Intergovernmental Panel on Climate Change (IPCC) in its 2007 assessment report. They concluded that 'understanding of these effects is too limited ... to provide a best estimate or an upper bound for sea level rise' in the twenty-first century. Excluding these effects, they projected a sea level rise of 0.26–0.59 metres [10-23 inches] by the 2090s for their highest-emissions scenario. The available evidence still doesn't allow us to say with certainty whether sea level rise could exceed the IPCC's projections. ...Although increases of up to two metres this century can't be ruled out, this does not mean that they are inevitable or even likely." "It is concluded that the best guess value of Sea Level Rise for the next 100 years is a relatively modest 23 cm +/− 5 cm [9 +/- 2 inches] which poses little threat to coastal areas of the world either at present or in future." 9. Sinclair lies that the South Dakota legislature passed a resolution urging schools not to teach the science of climate change, when the resolution says no such thing. It explicitly states that they recommend some points be included with the instruction of global warming. You can pause the video and read this for yourself. The wording of the resolution is also poor and it is fairly clear the legislature meant astronomical not astrological and geothermal not thermological. All the more reason politicians should consult scientists if they are not sure about scientific terminology. 10. Finally Sinclair lies about Marc Morano's comment about public flogging when the website it was quoted from explicitly says, "He doesn't wish anyone harm". For someone who likes to use clips from Monty Python Sinclair sure has a hard time identifying sarcastic remarks from those he is trying to smear. And let's not forget the censoring of anyone who does correct "The Cartoonist" on the "Crap of the week" videos. Many of time my comments are deleted and "Comments not allowed" is the norm rather then the exception..it is the way of the cowards and "the cartoonist" is fit mold. Great stuff, this Sinclair twerp for far too long has had this air (kinda like RealClimate) of scientific infallibility and objective authority among alarmists. It's about time someone really pointed out the holes in, and speciousness of, his viewpoint and attacks. And hey, isn't "Greenman" one of those types who endlessly attacks anyone he does not deem a "climate scientist?" And now he admits to being a non-scientist. What a flaming hypocrite! Great stuff man! Just thought you should realize that the terms liberal and conservative mean different things throughout the world. The Economist is "classically liberal" which means it favors the idea of limited government. When the newspaper was founded, the term "economism" denoted what would today be termed "fiscal conservatism" in the United States, or "economic liberalism" in the rest of the world. Donnie, unfortunately I just do not see many of the positions the magazine endorsing as "classically liberal", including endorsing a carbon tax, backing the Labor party, supporting stimulus spending and endorsing John Kerry for president of the United States in 2004. There is nothing classically liberal about any of those positions. But what seals the deal is their endorsement of the most socialist U.S. president since FDR, Barrack Obama. No the magazine is definitely NOT "classically liberal".